A little while ago Sarah Fitzmaurice, a work experience student at Zooniverse Oxford, spent a week working with the Milky Way Project database. She did some fun things with the data, including plotting the locations of many of the bubbles according to their distance from us. For many, the current canonical view of our own Galaxy comes from a combination of data sources, compiled by Robert Hurt, working at NASA JPL. The image is shown below, and you may recognise it: we use it as our Twitter/Facebook avatar. It is an artist’s impression based on several data sources and guided by astronomers. 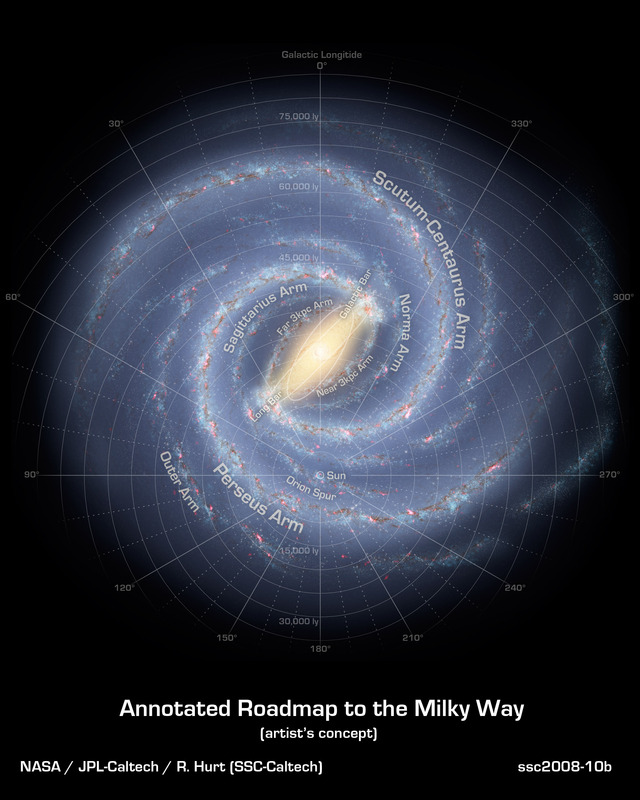 The Milky Way may be our home in the Universe but we know startlingly little about it. On key missing piece of information for many objects in our Galaxy is their distance from us. 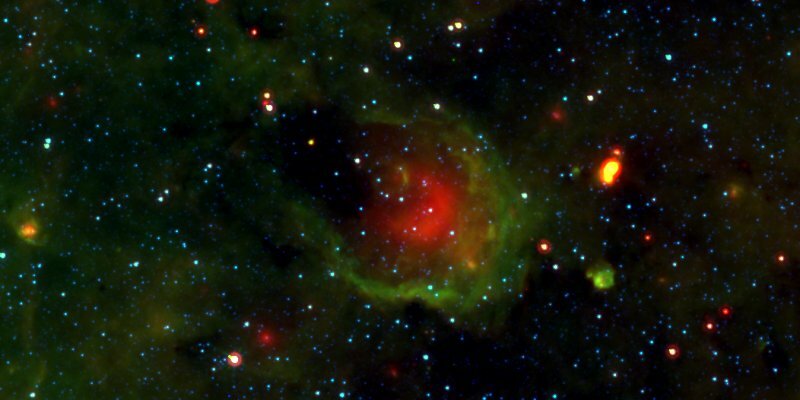 From the Spitzer data alone, we do not know the distance to the bubbles in the MWP. For our first Data Release paper, we compared the MWP Bubble catalogue to known objects, some with distances, and this allowed us to find out how far way some of the bubbles are. This enables us to investigate how large and sometimes how massive they may be. During her work experience week, Sarah plotted the bubbles with known distances onto Robert Hurt’s map of the Milky Way. The result is shown below. The bubbles are marked with crosses, and the size of the cross shows the relative size of the bubble. 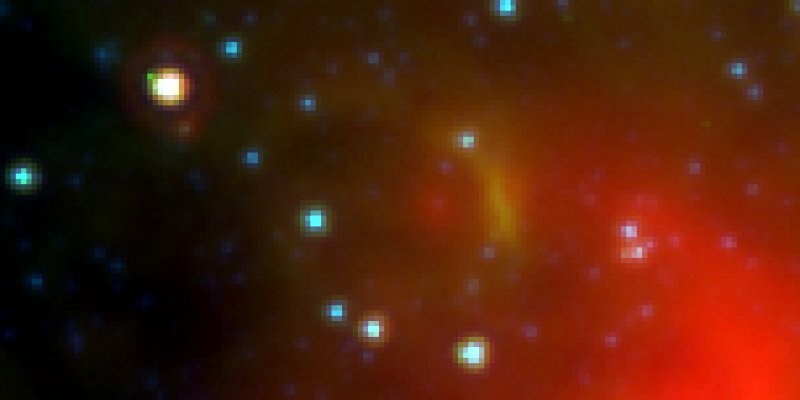 The distances to these bubbles were derived by comparing them to a known set of radio sources that are expected to look like bubbles in Spitzer data. You can see that the bubbles generally follow the distribution of spiral arms and that it is easier to see the bubbles nearby than those farther away. This is good because it is roughly what we expect. This map also allows us to easily spot the isolated, nearby or most-distant bubbles in the project. Much of Sarah’s week was spent looking at each of the interesting bubbles and finding out some more about them. Although there may well be more distant bubbles in the catalogue, Sarah’s map provides a candidate for ‘most distant bubble’ in the MWP. It is one of a pair of bubbles located on the far side of the Perseus arm, almost 45,000 light years away from the Sun – in the top part of the above image. Using the new MWP coordinates tool we can take a look at this distant object, and two nice images of it are shown below. Our ‘most distant bubble’ is actually located within another larger, clearer bubble, the image of this is also given. This is a line-of-sight effect and they are not necessarily near each other. This bubble is located literally on the other side of our Galaxy and is roughly 15 light years across. The fact that the two bubbles are positioned on top of each other makes it hard to decide which one is farther away. There are many more instances where bubbles lie on top of each other where it would be impossible to decide which is actually on top of which. The nebulous material of which these objects are made makes them hard to disentangle. In this case there are stars and IR objects on top of the smaller bubble that make it easier to pick out the nearer and farther bubble. In this case, the distance value is derived from a radio source that we expect to be associated with a bubble. Both of these bubbles lie at roughly the correct position to be associated with the radio source. Since we know the radio source is very far away, we can say that the smaller bubble is most likely the object associated with the radio source. These kinds of confusing caveats are one of the things that make Galactic astronomy difficult and challenging. For these reasons, this might be the most distant bubble we know of in the MWP – or it might not. Either way, this awesome little bubble has provided the opportunity to discuss the ways that we determine the distances to objects in the MWP catalogue, and how doing astronomy in our cosmic backyard is tricky territory indeed. 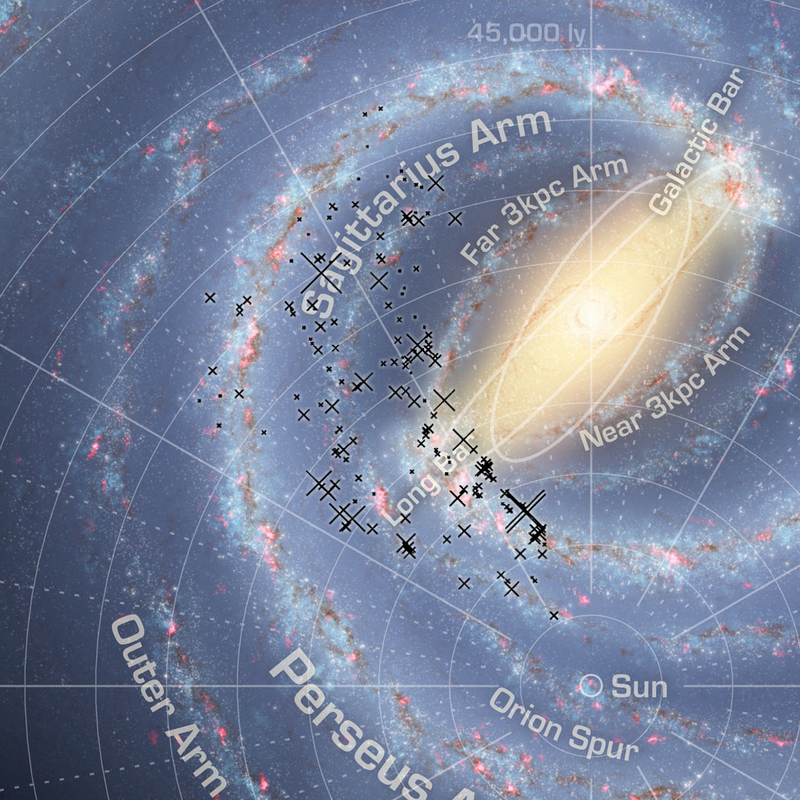 There’s a new Milky Way Project paper out on the arXiv. It was submitted to the Astrophysical Journal last week and concerns the topic of the triggered formation of massive stars. This study was lead by Sarah Kendrew and utilises the results of the first MWP paper (our catalogue of bubbles). One of the main reasons for undertaking the MWP was to produce a large bubble catalogue that would allow statistical studies of star formation sites in our Galaxy. In the end we produced a list of bubbles ten times larger than the previous best catalogue in our first data release (DR1). In this new study, we’ve used statistical techniques to see what correlations exist between the MWP bubbles and the RMS Catalogue: a well-used catalogue of infrared sources along the Galactic plane (a similar region to that covered by the Spitzer data used in the MWP). The paper looks for any signs that there is a correlation between the positions of RMS sources and the positions of the MWP bubbles. Specifically we’re trying to see if such massive young stellar objects (MYSOs, stars being formed) are most commonly found on the rims of bubbles. If this is true, then it adds to evidence for a mode of star formation where the formation of some stars triggers the formation of others. 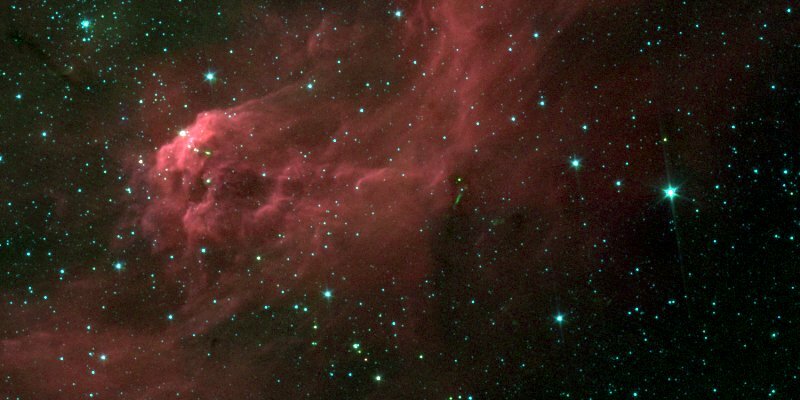 In this case, young, hots stars blow out a bubble in the interstellar medium. During this process, clumps of material occur in which new stars condense and form. This new study finds a strong correlation between MYSOs and the MWP bubbles. We find that Atwood thirds of the MYSOs surveyed are associated with bubbles and 22% are associated with bubble rims. We also see that larger bubbles are more likely to have MYSOs on their rims – though one of the main issues we encountered is that the effect of line-of-sight confusion makes the situation complicated. This second paper is the first to follow on from the MWP DR1 paper, and there are more planned. You can read the paper on arXiv. The Milky Way Project itself, and this study, we’re presented at the UK/Germany National Astronomy Meeting this week in Manchester. We’re excited to announce that we have updated the Milky Way Project to show you more bubbles and to produce even more science! After creating our catalogue of 5,106 bubbles earlier this year, we’re aiming to try and refine and improve our measurements of the MWP Bubble catalogue by asking you to measure each and every bubble in greater detail. This means that for a while we’ll no longer be displaying images from across the plane of our Galaxy, but instead we’ll just be showing you images of regions where you told us that bubbles are located. Our recently accepted Data Release 1 (DR1) paper, ‘A Bubblier Galactic Disk‘ is already online and being used by astrophysicists to help better understand star formation in our Galaxy. Later this month we’ll be presenting the MWP at the UK/Germany National Astronomy and SEO Consultant Meeting in Manchester. We will hopefully be able to bring you some updates at that time so you can follow along. In that paper we estimated that our rate of discovery of new bubbles had declined over time to the level where only a few new bubbles were being discovered each month. This make sense of course. The more people that inspect all the images on the site, the less likely it is for a bubble to remain undiscovered. What becomes important are the multiple, independent drawings of each bubble. To reflect this, we have updated the MWP site to shift from showing random portions of the Galaxy, to showing the places we believe there are bubbles – based on your classifications. 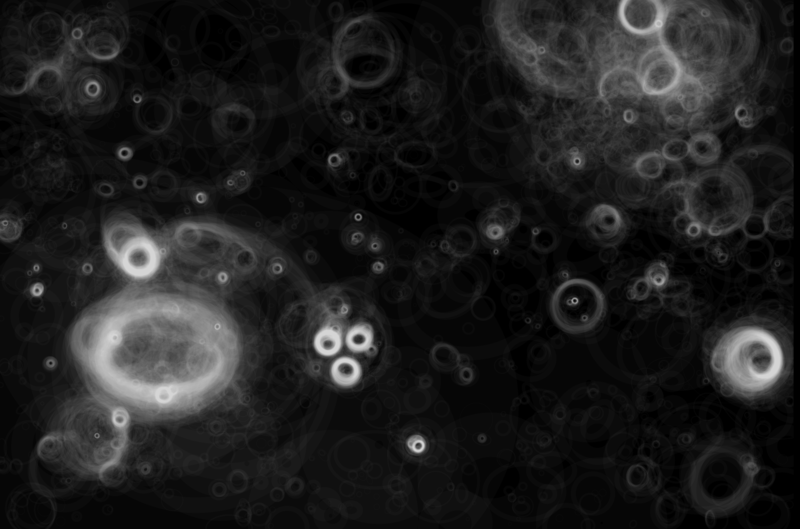 Each image you are now shown on the site contains one of the 5,106 bubbles contained in the DR1 catalogue. It’s seems really fitting that the MWP community is now inspecting the very catalogue it created. This update to the site has two effects. First of all it means that you are able to see each bubble more clearly and thus make more precise measurements of their shape, size and thickness. It also means that you see a lot more bubbles! There now ought to be at least one bubble in every image, which is a lot of fun. It also means that Talk has been updated with a host of new bubble-centrd images, showing off all 5,106 of the DR1 catalogue’s bubbles. We have made some other updates to the site as well. We have put up our contributors page, which lists the names of everyone that made the DR1 paper possible. We have also finally added the term ‘Yellow Ball’ to our list of objects you can mark in images. 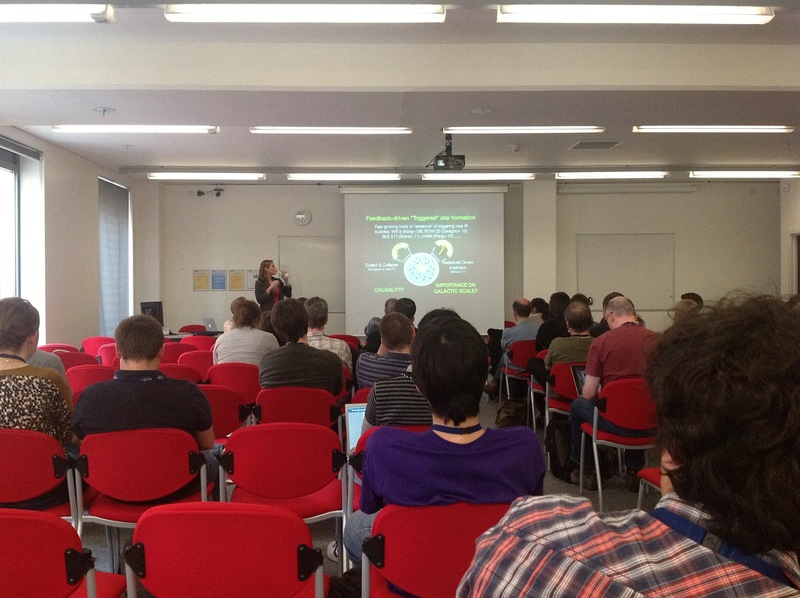 The #yellowballs are a term coined on Talk by the MWP community and turn out to be interesting to researchers at they appear to represent ultra-compact star forming regions. Don’t forget to follow us on Twitter @milkywayproj for the latest updates, and our Facebook page too. We submitted the first Milky Way Project paper to the Monthly Notices of the Royal Astronomical Society (MNRAS) in December and the referee has been very kind to us so far. We have our fingers crossed for acceptance soon. Thanks to recent media coverage and some awesome buzz at the recent AAS meeting we decided to go ahead and post our paper to the arXiv yesterday. In addition to the paper, which explains how the catalogue was created from all your bubble drawings, we have also made the data available on the MWP site. You can explore the data graphically or download various files on our data page. Data release 1 (DR1) currently consists of a catalogue of large bubbles, a catalogue of small bubbles and a set of ‘heat maps’ (more on that in a moment). We are aiming to add green knots, red fuzzes, star clusters and galaxies to this list later in the year. We’ve called it DR1 because we also hope to refine and improve our catalogue – partly based on feedback from the community – and release a second set of data (DR2) later in 2012. Hopefully 2012 will be a big year for the project! The other big change that we need to make to the site in the next few days is the release of an official ‘authors’ page, crediting all our citizen scientist volunteers. 40,000+ individuals have taken part in the MWP and those who contributed to DR1 will be credited on the site soon. I’ll blog when that happens to let you know. All of this doesn’t mean the MWP is over though: far from it. In fact, the classifications you make now will be collectively refining and improving the data we have produced so far. We have plans, which i’ll explain at a later time, to modify the MWP interface so that each classifications contributed more efficiently to the final result. We also have new data to come in 2012 that will mean we can search for bubbles in whole new regions of the sky. Very exciting and there is much to look forward to in 2012!